To preserve the historic Gasholder Building through sensitive adaptive reuse. To develop a multi-modal transportation park. 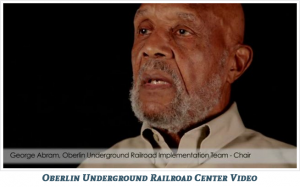 To tell the story of the Underground Railroad and Oberlin’s important role in that era. The Gasholder Building, built in 1889, is a unique remnant of our industrial heritage, the only known surviving gasholder structure west of the Appalachian Mountains. The Gasholder Building was used to store manufactured coal gas from 1889 until 1918. Coal gas provided both light and heat in many late 19th century cities including Oberlin. In 1998, the U.S. Department of the Interior listed the “Oberlin Gas Lighting Company Gasholder House” on the National Register of Historic Places. As an industrial facility, the Gasholder Building was located immediately adjacent to the Toledo, Norwalk, and Cleveland Railway line, in order to transport coal gas to consumers far and wide. Although the railroad has not operated this route since the 1960s, the railway corridor has been converted to a bike trail and is now part of the 13.1 mile Lorain County section of the North Coast Inland Trail. It is the City’s intent to rehabilitate the site of the Gasholder Building to develop a “Park & Ride” facility for North Coast Inland bicyclists, in-line skaters, and pedestrians. The proposed “Park & Ride” would include approximately 22 new parking spaces, a public restroom facility, and other public amenities. The Lorain County Transit Authority, which operates bus services throughout Lorain County, currently maintains a bus stop on the west side of State Route 58, approximately 500 feet from the project site. LCT has indicated their willingness to relocate and enhance this bus stop to the newly-developed Underground Railroad Center. This public transit would help Oberlin and Lorain County promote Heritage tourism, an increasingly important part of our economies. The Underground Railroad Center would make use of the renovated Gasholder Building to promote an understanding of the importance of the Oberlin areas in the national history of the Underground Railroad. This historic transportation network is an integral part of the American cultural experience. Programming in the building would include lectures, participatory activities, interactive displays, and theater and dance productions designed to raise awareness of Oberlin’s unique history as Station 99 on the Underground Railroad. There would also be a permanent exhibit detailing the role of this industrial building in the work of 19th century transportation.